I was on the lead bird when I snapped this picture of our other chopper of Blues. It was late afternoon when we landed in Phuoc Vinh after another long day in the hot steamy jungle. I was looking forward to a long cool shower and maybe a beer or two before I hit the sack. As we walk the short distance from the helipad to our hooch someone hollered out those all too familiar words “down bird”. We all did an about face and scrambled back to our choppers, which were by then fully cranked and ready to go. We were informed that one of our Scout birds was downed by ground fire in Cambodia. We all knew it would be dark, by the time we reached the downed Loach but that didn’t matter in this life or death situation. There was always a chance the crew of the downed bird survived the crash and needed our help, so we had to reach their location as quickly as possible. 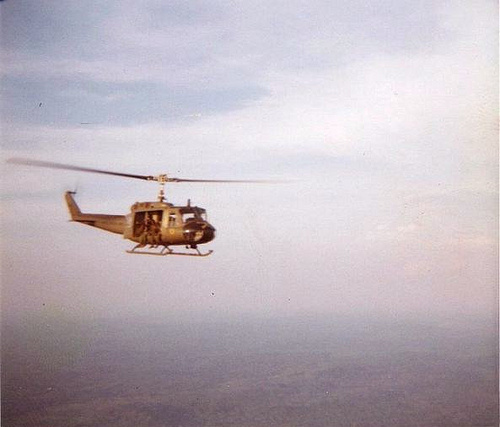 When we reached the area of the crash our Lift pilot hovered our bird over the treetops in position for us to rappel. Only a few of us Blues rappelled into the darkness of the jungle that night. I had a radio on my back when I went down and recall getting tangled up in the jungle’s undergrowth before my feet hit the ground. Then the real drama began! 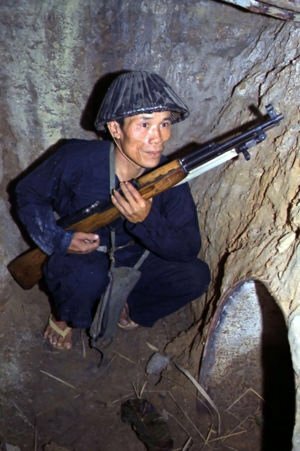 It was our understanding, there were no friendlies in this part of Cambodia, which clearly made it a ‘free-fire zone”. We heard movement not far from our position, and it had to be one of two things. Either the crew of the downed bird survived or ‘Charlie’ was closing in on us. We were ready for the worse-case scenario which was of course ‘Charlie’. There was a slim chance the crew survived the crash so we expected the latter. That’s when a call came over my radio “hold your fire”. The movement was a squad of friendlies from a grunt company that beat us to the downed bird.